Sprint Activating 4G LTE Network in 9 New Cities in "Coming Months"
Sprint's 4G LTE network is beginning to take shape: the carrier announced today that, within the "coming months" it will activate the high speed data network in nine new markets. The new areas include: Minneapolis and St. Paul Minn.; Oakland, Fremont and Hayward, CA. ; Key West, Florida; Fort Smith, Arkansas; Michigan City, La Porte and Bloomington, Indiana; Eau Claire, Wisconsin; Ardmore, Oklahoma; McAllen, Edinburg and Mission, Texas. "We're committed to providing improved 3G and 4G LTE as quickly as possible, and keeping our customers informed as to when and where they can experience the new network's superior performance and speed," said Bob Azzi, senior vice president-Network, Sprint. "Our customers depend on their mobile devices as their primary source of communication, business connectivity and entertainment. We're delivering all of that functionality at a very competitive price." Sprint also reconfirmed that it will launch its 4G LTE entwork in 125 major metropolitan areas, including Boston, New York, LA and more. OVERLAND PARK, Kan.–(BUSINESS WIRE)–Continuing its aggressive push to deliver an enhanced top-tier network experience for customers, Sprint (NYSE:S) announced today that its 4G LTE network build is progressing in nine additional cities within its nationwide 3G footprint. "Our customers depend on their mobile devices as their primary source of communication, business connectivity and entertainment. We're delivering all of that functionality at a very competitive price." – Minneapolis/St. Paul, Minn. – Fort Smith, Ark. – Ardmore, Okla.
– Key West, Fla. – Bloomington, Ind. During the pre-launch phase, Sprint customers with capable devices may begin to see 4G LTE coverage in these areas and are welcome to use the network even before it officially launches. Sprint plans to announce commercial availability of 4G LTE in these cities in the coming months, followed by continued enhancements in coverage, performance and reliability. Ultimately, Sprint's 4G LTE coverage is expected to largely match the existing nationwide 3G footprint. Sprint has announced more than 125 cities where Sprint 4G LTE is on its way, including Boston; Charlotte, N.C.; Indianapolis; Los Angeles; Memphis, Tenn.; Miami; Nashville, Tenn.; New Orleans; New York; Philadelphia; and Washington, D.C. To find out more about which markets currently have Sprint 4G LTE and which markets are coming next, please visitwww.sprint.com/4GLTE. Sprint introduced its all-new 4G LTE network in July 2012 and currently offers service in 32 cities1. As part of its overall network strategy, Sprint is also doing a complete overhaul of its 3G infrastructure so that customers can enjoy better wireless signal strength, in-building coverage, and fewer dropped/blocked calls. These enhancements are now available to customers in several markets across the country, with significant deployment in Baltimore, Boston, Chicago, Los Angeles, New York and Washington, D.C., and will continue to improve in the weeks and months ahead. With these enhancements to Sprint's 3G network, the company's prepaid customers, on Virgin Mobile and Boost Mobile, will also benefit and can expect to see better coverage, improved network reliability and voice quality resulting in up to 20 to 30 percent fewer dropped and blocked calls. In today's competitive wireless market, the value of unlimited has never been more apparent and Sprint is clearly a leading choice in wireless. Customers with capable devices can combine Sprint's all-new 3G and 4G LTE networks and enjoy unlimited data while on the Sprint network. Data usage continues to increase and consumers value Truly Unlimited data because it's simple and straightforward – while on the Sprint network there is no metering, no throttling, and no need to share data, which increases the likelihood of a surprise monthly bill because of overage charges. Sprint Nextel offers a comprehensive range of wireless and wireline communications services bringing the freedom of mobility to consumers, businesses and government users. Sprint Nextel served nearly 56 million customers at the end of the third quarter of 2012 and is widely recognized for developing, engineering and deploying innovative technologies, including the first wireless 4G service from a national carrier in the United States; offering industry-leading mobile data services, leading prepaid brands including Virgin Mobile USA, Boost Mobile, and Assurance Wireless; instant national and international push-to-talk capabilities; and a global Tier 1 Internet backbone. 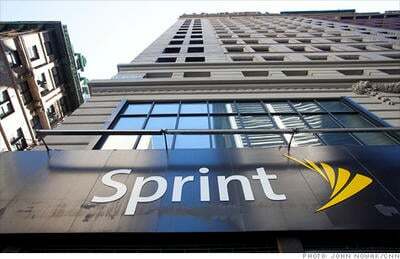 The American Customer Satisfaction Index rated Sprint No. 1 among all national carriers in customer satisfaction and most improved, across all 47 industries, during the last four years. Newsweek ranked Sprint No. 3 in both its 2011 and 2012 Green Rankings, listing it as one of the nation's greenest companies, the highest of any telecommunications company. 1 Atlanta, Ga.; Athens, Ga.; Baltimore, Md. ; Barnstable-Hyannis/Mid-Cape, Mass. ; Calhoun, Ga.; Carrollton, Ga.; Chicago-Naperville-Joliet, Ill.; Gainesville, Ga.; Dallas; Fort Worth, Texas; Gary, Ind. ; Granbury-Hood County, Texas; Houston; Huntsville, Texas; Hutchinson, Kan.; Lawrence, Kan.; Kankakee/Bradley/Bourbonnais, Ill.; Kansas City, Mo.-Kan.; McPherson, Kan.; Manhattan/Junction City, Kan.; New Bedford/Fall River, Mass. ; Newnan, Ga.; Rockford, Ill.; Rome, Ga.; San Antonio, Texas; Sedalia, Mo. ; St. Joseph, Mo.-Kan.; Topeka, Kan.; Waco, Texas; Waukegan-Lake County, Ill.; Wichita, Kan.; Wichita Falls, Texas.